Our tax code is horribly inefficient. Compliance time is 8 billion man-hours. Time when people could be working or taking leisure. A Flat Tax is a political looser, because it helps business and the wealthy more than the average Joe. Either a large Standard Deduction or a UBI is necessary to make the Flat Tax progressive. However, with a UBI you would get rid of federal welfare and improve other disincentives in the safety-net system and you can separate UBI distribution from tax collection (collect 25% from gross salary, no perks). Along with lowering the marginal rate, you would have efficiency benefits and reduce the size of federal employment by about 1 million people. I apologize to those who dislike a UBI, but please argue the merits, if you feel I’m wrong. A $1 UBI would be great, a $100,000 would be awful. Poverty level for federal, with the states free to do as they please??? After interest, 70% of our federal spending is redistribution now. If you take tax cuts alone, the Reagan tax cuts allowed new businesses to get started and flourish through the 90’s (tech revolution). Inspite of Bush 41 and Clinton’s tax increases. The tax increases of the 90’s caused the Bush 43 and Obama slow downs. 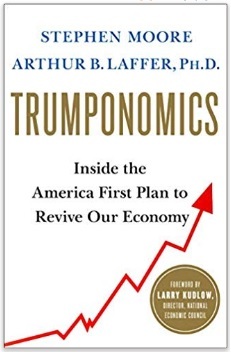 Obama did not cause the 10’s, but investment was just waiting to break out, when Trump came along with Trumponomics. It’s almost as if Chait is rejecting the truth.